Marshall Exteriors is the go-to expert for installing replacement windows in your home. As a Marvin Authorized Replacement Contractor we will guide you through the window replacement process every step of the way. We will listen to your needs, review your options, carefully measure, accurately order and then install your new windows and doors. As a window replacement expert we will provide you with a worry-free, professional experience. Not only do we have the window options you are looking for, but we have the expertise. Windows can be great quality and look amazing but, function poorly when installed incorrectly. It is such a pity to see a window unable to close all the way or leaking air into the home because of a lazy contractor. Our highly skilled crews know the proper way to install your windows to make sure they last a lifetime. 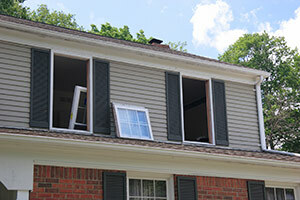 We provide Free No Cost Estimates for our window replacement services. Call us today at 1-855-237-7177 or Get Your Free Estimate Online! We service Fairport, Canandaigua, Geneva, Newark, Victor, Ontario, Seneca Falls, Waterloo, Farmington, Macedon and areas nearby. Energy savings: During summers and especially during cold winters, properly selected and installed windows can keep your home comfortable and your energy bills lower. Aesthetics: Beyond utility, a new window also greatly improves the curb appeal of your home as well as the appearance of the interior. We offer so many different materials and styles for this reason. Easy to maintain: Having great windows is not much help if they are difficult to clean and quickly degrade. Our select windows are easy to clean and take care of and the materials available are durable and require little maintenance. The Integrity brand is Built to Perform®. Our products, made with Ultrex® pultruded fiberglass, feature the industry's first and only AAMA verified 624-10 finish. Ultrex outperforms and outlasts vinyl, roll-form aluminum, and other composites. Superior material performance and unmatched fast, efficient delivery make Integrity windows and doors a great overall value. Ultrex® is 8 times stronger than vinyl. Virtually maintenance free. Superior resistance to scratching and denting. Ultrex employs an acrylic finish to provide long-term color retention and durability. Replicates appearance of traditional wood windows. Long term stability reduces risk of seal failures and air leakage. Fiberglass has a 38% longer useful life expectancy than vinyl. Low-E glazing can reduce your heating and cooling bills by up to 30%. We have already mentioned that we offer a number of different materials for replacing your old windows, but choosing replacement windows does not need to be daunting. Our experts will sit down with you and explain the pros and cons of each of the materials and windows styles you can make a better educated decision; one that fits your budget and style. We specialize in Marvin replacement windows, and we'll be happy to discuss how they will work for you. Replacing your old windows doesn't have to be complicated. When it comes to installing the window itself into your home, our window options come with quick, hassle-free installation. We can be in and out of your house quickly leaving you with new, beautiful windows. One option is insert windows which fit snugly into your old frame. These are economical and provide easy installation as they don't require the removing of old moldings. Washing and maintenance are also a cinch. Another choice is sash kits which also use the existing frame. Vinyl jam lines are added to the existing jamb and the window slides easily along the line. These windows tile for easy cleaning and maintenance, but installation requires the window frames be square and stable. The third option is a full-frame replacement window where the moldings are removed. These require longer installation but the window size is not diminished like it is with sash kits and insert windows. Let's get started replacing your windows! Replacing your windows brings so many benefits: improved home energy efficiency, home comfort, visual appeal and more. Marshall Exteriors is The Greater Finger Lakes Area's most trusted window replacement company, including a proven installer of Marvin replacement windows. As the 2017 Better Business Bureau Torch Award for Ethics recipient, you can count on Marshall Exteriors to always do what's right for your project. We service most areas in the state of New York, including Geneva, Fairport, Newark, Canandaigua, Victor, Ontario, Seneca Falls, Waterloo, Farmington, Macedon, and many more. Get started with a Free Estimate!